2012 Ford/Spartan Quick Attack Mini-Pumper was placed into service on May 8, 2013. It is equipped with a 1000 GPM pump, 300 gallons of water and 20 gallons of Class A foam. It is also equipped with a 9500 LB. rescue winch and is fitted with a complete towing package to transport the department's boat, Kubota RTV off road vehicle and trailer. This truck was purchased, to replace our aging Brush 1, using a combination of Grant funds, USDA loan and Fire Department funds at a cost of approximately $216,000 including all allied equipment. 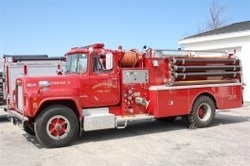 1971 Mack pumper purchased new at a cost of $37,000. It carries 1000 gallons of water and equipment for chimney fires. The truck was reconditioned in 2001 by a professional fire apparatus company at a cost of $35,000. The replacement cost is approximately $210,000. 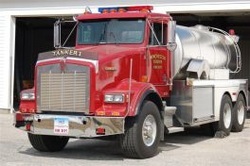 1989 Kenworth 3,000 gallon tanker with a portable pond to hold the water from the tank, and a portable pump. This was built by members of the department by purchasing a used truck chassis, a new tank/body and related equipment in 2002 at a cost of $72,000. The replacement cost is approximately $205,000. 2009 International/Rosenbauer 4 wheel drive pumper purchased new at a cost of $250,000 plus an additional $15,000 for new hose and equipment to meet current standards. It is equipped with a five person cab and has a foam induction system to enhance firefighting capabilities. This new pumper was placed in service in April 2009 and replaces our old 1951 Mack which was sold to help pay for the new truck. 2015 12 foot inflatable rescue boat with Honda motor and trailer, purchased with donations from local residents at a cost of $8000.00. Equipped with throw ropes and rescue ring, search lights and life vests. This allows us to conduct search and rescue operations on the various bodies of water in our area and surrounding towns. 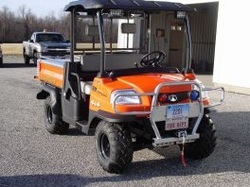 2006 Kubota RTV off road utility vehicle which was purchased with Homeland Security Funds and equipped with brush fire fighting equipment and an off road rescue unit purchased for us by the Winsted Area Ambulance Association. This equipment is utilized for brush fires and rescues in remote areas not accessible to motor vehicles.